Former soldier Gary Jamieson lost three limbs while on tour in Afghanistan. 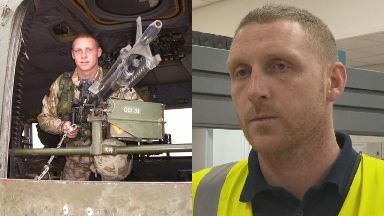 A former soldier who lost three limbs whilst on tour in Afghanistan has found a new lease of life thanks to an innovative factory. 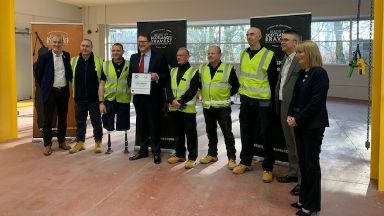 Gary Jamieson, who lost both of his legs below the knee and his left arm above the elbow while on patrol with the 1st Battalion Scots Guards in 2010, has been given the chance to work with Scotland's Bravest Manufacturing Company (SBMC). Run by the Royal British Legion Industries (RBLI), the Renfrewshire-based factory offers a jobs in the manufacturing sector to Scottish veterans who have experienced physical or psychological challenges as a result of time spent in the forces. Mr Jamieson, from Strathaven in South Lanarkshire, has been trained as a water jet cutter and will pass his skills on to other veterans. He told STV News: "I thought if I'm going to push myself, this will be the place to do it. Strong: Gary Jamieson lost three limbs whilst on tour in Afghanistan. "It's been five months now, and there's nothing here I can't do. "It's taken me a bit longer to master it, but I had to learn it a different way from everybody else. And that was the whole idea round about this. "Now if I go down for a future job, I can say 'I can do this and I can do that, but it has to be done this way and that way', which helps me in the future and obviously help other veterans coming through." After retiring from the armed forces, Mr Jamieson got bored sitting around at home but struggled deciding what he wanted to do next. He said: "I can't sit about - it's not in my nature to do it, and I'm glad that this came up, this opportunity, because that's where I was struggling the most. "Being in the army, you think you're going to do your entire career in the army. "And obviously things like this happen and throw your plan out the window, so you're not even thinking about work and stuff like that. "I had to sit back and think, 'my abilities, what can I put forward to it'. When I look back, I can say this is where I want to go now. "This came up at the right time in my life. I came here to push myself and see my limits. "I know there will be veterans that think that they can't work because of what's wrong with them, but hopefully if they can see me they'll maybe get that opportunity to say 'let's try it'." SBMC has contracts with Network Rail and Amey Scotland and plans to grow its current team of 13 to 150 over the next three years. Scottish veterans commissioner, Charlie Wallace, visited SBMC last week, ahead of its official launch later this year. He said: "Whilst we are lucky in Scotland to already have a wealth of veteran-friendly employers, there is a requirement for more organisations and businesses to recognise the pool of talent our ex-armed forces personnel offer in civilian workplaces. "SBMC is an outstanding example of how our veterans can transfer their military skills into the workplace, learn new skills and thrive. "As the first of its kind in the UK, it's encouraging to see Scotland pave the way in providing dedicated armed forces enterprises which are ultimately a lifeline to many veterans and their families. "I'd like to see more employers and organisations across Scotland take action in championing an armed forces recruitment programme."